AMPROFON Gold Sales Award – "24 Nights"
This is a Gold record award presented to rock guitarist Eric Clapton by the Asociación Mexicana de Productores de Fonogramas y Videogramas (AMPROFON) to commemorate album sales of more than 100,000 copies of "24 Nights" in Mexico. 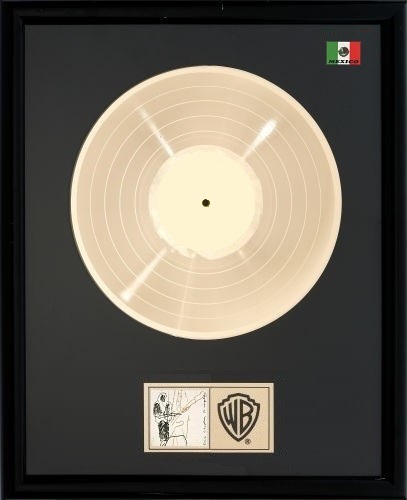 This Gold sales award was presented to Eric Clapton by the Asociación Mexicana de Productores de Fonogramas y Videogramas (AMPROFON) to commemorate the sale of more than 100,000 copies of "24 Nights" in Mexico. No reviews or videos yet for AMPROFON Gold Sales Award – "24 Nights". With an Equipboard account you can rate this item, add it to your collection, submit a review to discuss what you like and dislike about it, and associate AMPROFON Gold Sales Award – "24 Nights" to artists that use it. Create an account! See Who Uses AMPROFON Gold Sales Award – "24 Nights"